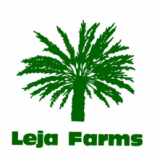 Leja Farms mail order service is committed to offering gourmet farm fresh dates from our family to yours. Our dates are hand graded and selected for their superior quality. 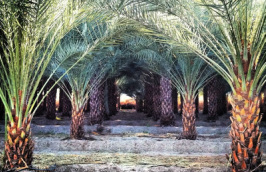 Leja Farms offers dates from the current harvest only with package options to fit your needs. We keep a timely delivery in mind to ensure same week delivery so not to compromise freshness. Deglet Noor dates are a perfect snack and are the most commercially offered date found. Their chewy texture and nutty flavor offer a subtler sweetness for both eating and baking. Whether you prefer natural, hydrated or pitted, Deglet Noor dates are especially pleasing to refined taste buds. The Deglet Noor harvest begins late September and sells out in spring. Medjool dates are known for their impressive size and maple syrup-like depth of flavor. This combination, and its succulent meaty texture ensure a well-deserved spot in the popular crowd. Medjool dates are truly a gourmet delicacy offering a unique and pleasurable experience. The Medjool harvest begins in August and its popularity guarantee it will sell out early in the spring. Barhi dates are often compared to the rich and sweet taste of a carmel. Its round shape easily distinguishes it from other date varieties. Barhi dates are harvested early October. Honey dates suit their name well. Their golden color looks like honey and their sweet lingering flavor is reminiscent of the same. 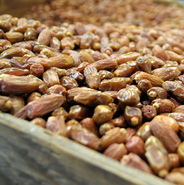 Honey dates are harvested in early October. 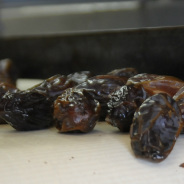 Date Pieces are a mechanically extruded date piece tossed in oat flour. "Seeded and chopped" and ready to enjoy it is often found in trail mixes and cereals. Dates pieces are a great snack and a tasty addition to many baking recipes. Date pieces are available throughout the season.